Foreseeing the ridiculous amount of work over the next few weeks, I decided to have a “mini-notebook” check. The students turned in their notebooks after updating it according to the provided table of contents (theoretically). I went through each individual student’s notebook and placed notes where things were missing, incomplete, or incorrect. This was a boatload of work for me—according to some teachers, “over-grading.” It will make grading easier next week when they turn in their final notebooks (including additional material from the past few days). 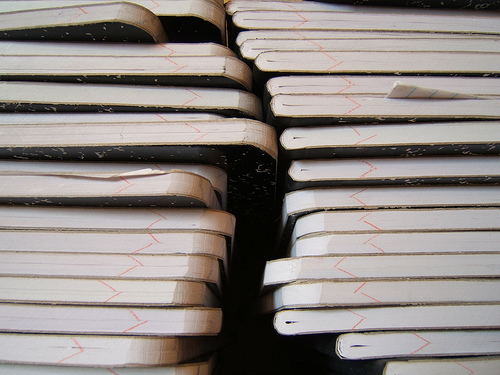 Usually, the students turn their notebooks in on the day of the test. However, seeing as though the test also happens to be a day before the end of the grading period and two days before the conclusion of my student teaching, I feel that it is essential that I check to see that the students are on task and familiar with the material before it is too late. The last thing I want to do is leave my CT with irate parents and students who learned nothing during the unit. I will not have the opportunity to reteach and students (especially young middle school children) can easily slip through the cracks. The students need to be accountable and independent; such extreme measures might be a bit overbearing according to some. I would argue that it holds students to a higher degree of accountability. The expectations are now VERY clear to them and they know that their notebooks are being thoroughly examined, not just glanced at (or only portions graded) Therefore, there is no debate regarding grades and a clear understanding that all in-class assignments and notes need to be completed thoroughly. Remaining on task and focused in class is essential (I rarely give homework other than completing assignments from class, study guides, and updating notebooks). Some students didn’t feel as though it was important to complete all of the entries and were given “tentative failing grades” (and harassing, yet encouraging emails over the weekend). NINE students showed up before school for one of my extra help sessions last week; I’m interested to see how many show up tomorrow after getting their notebooks back today…A number of students are unable to get to school early due to transportation issues; I tend to give them a bit more leeway in terms of time frames (ex. Bobby-Joe will have until Wednesday to get everything fixed to change his “mini-notebook check” grade from failing to passing rather than tomorrow. He will also have the option of seeing me during lunch–*note: all students ALWAYS have this option).